Gingivitis should be treated promptly to maintain kitty's oral health. With his excessive grooming habits, you might not be worried about your kitten’s oral health. However, cats as young as 6 months can experience the earliest stage of periodontal disease -- gingivitis. Protect your favorite feline from gingivitis with daily home care and a helping hand from your vet. Gingivitis is common in older felines, but the exact cause of juvenile-onset gingivitis is unknown. 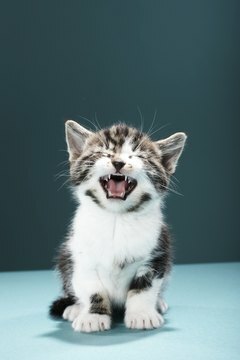 Kittens can acquire gingivitis even with little tartar buildup, but factors such as crowded teeth, poor chewing habits, lack of oral health, eating soft food, open mouth breathing and some autoimmune diseases can increase their risk. According to veterinarian Arnold Plotnick, genetics may be a leading factor in developing gingivitis in kittens, as some purebreds are more susceptible. If your kitten has gingivitis, he may need a little extra TLC at home to avoid premature tooth loss. Gingivitis can take over your poor kitten’s mouth if not treated in a speedy manner. Severe inflammation, redness, swelling, bad breath and even bleeding can occur as the gums, teeth and mouth suffer. Some kittens may experience painful lesions that can go onto proliferate the gums. You may also notice that your kitten is excessively drooling. When the condition becomes severe enough, your kitten may stop trying to eat. He may only lick at food for fear of the pain that chewing presents. If your kitty’s gingivitis is not treated promptly, he may begin losing teeth. If your kitten has been diagnosed with gingivitis, your vet may suggest professional cleaning. Under general anesthesia, your kitten will have any plaque removed from the surface of his teeth and root surfaces cleaned. Overcrowded teeth may be removed to prevent food and tarter buildup. Since kittens with gingivitis need consistent home care, your vet may teach you how to care for kitty’s oral health at home. Before and after the dental procedure, you should receive antibiotics to control the spread of bacteria. Cat’s need their teeth brushed, too! Maintain your kitten’s oral health by rubbing his little teeth one to two times per day with veterinary toothpaste and a special finger pad. Brighten his pearly whites by applying light pressure as you push back his lips. The ASPCA recommends performing the “breath test” on your kitten on occasion to check for any offensive odor. If an odor, swelling or inflammation reoccurs inside kitty’s mouth, contact your vet. Your vet may recommend a chew toy for your frisky feline, as cat toys can make teeth strong and gently massage the gums while eating away at tarter. Cat Channel: Too Young for Gum Disease? Do Cats Have Seasonal Allergies?